Enough sitting. I want to stand while I’m working. That’s the concept, at least. 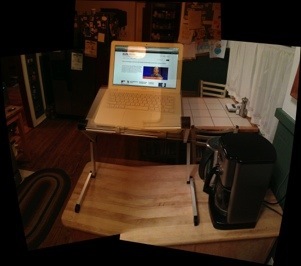 I’m experimenting with a Furinno Multi-functional Portable Desk, which my wife bought for about $50. It wobbles a bit, but not too much, and it’s definitely portable and adjustable — two things I really like about it. After all, I do a lot of my work — my writing — on a MacBook, and I need something I’m able to move around the house. If you’re looking for more advice on standing desks, here’s an article with 15 ideas for buying or building one. Reading your article…about 7 years ago I assembled my new office room with all ikea components, including a desk with an electric motor and telescoping legs that allow me to work standing up. Don’t know whether it’s still available, but it was part of the Galant series, matches the other tables and cabinets. I haven’t heard about that one, Linda, but I’ll look into it — it sounds interesting.